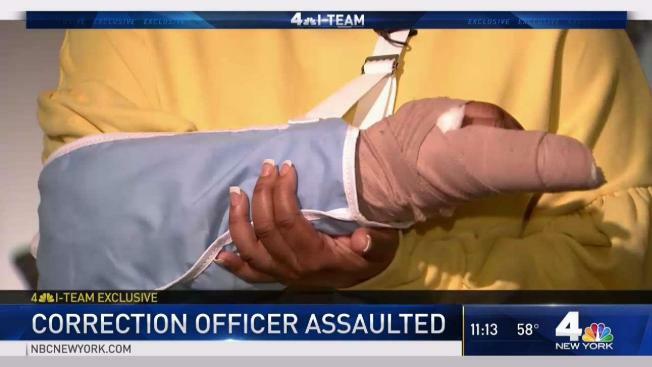 A New York City correction officer who was brutally beaten on a Bronx subway platform last month, suffering a fractured orbital bone and a broken wrist, said she thought she would die in the attack. Quinn Thomas told her harrowing story of the subway attack in an exclusive interview with the I-Team, just weeks after the horrific assault. It started as a normal afternoon commute for Thomas, who’d left her correction job in Manhattan on April 27. But as the no. 6 train approached the Parkchester station in the Bronx, Thomas says a man on the train falsely accused her of "dissing" him and his girlfriend. She said she ignored him and stepped off at the stop. He followed her and began unleashing profanities, then spit on her. "I turned around to my right to see where the spit landed and before I could see where he was, he just started punching my face," said Thomas. Thomas said the assailant targeted her eyes, leaving them blackened and bloodshot, and he became enraged when she identified herself as an officer. “He took my shield and my phone and he just ran,” she said. A witness to the incident, Tatiana Burks, told the I-Team, “It was intentional. It was malicious," adding that Thomas tried to avoid confrontation. NYPD officers arrested 28 year-old Joshua Allen near the scene. He was initially charged with robbery but only misdemeanor assault. Thomas said prosecutors in the Bronx district attorney's office told her Allen was a first-time offender and that going to trial would be a waste of time. She said prosecutors told her they would be offering Allen a deal of three years probation and a couple of months in jail. “They said the attack wasn’t intentional,” she said. “He intentionally tried to severely injure me and he did,” she said, calling the Bronx D.A.’s office a disappointment and a disgrace. Thomas said she had no idea until the I-Team told her that Allen had been released. Documents show he was released on his own recognizance. The DA’s office said cash bail had been set at $2,500. Elias Hasmudeen, president of the Correction Officer’s Union, said, “There’s no way he should be out of jail. The Bronx D.A.’s office screwed up. They made a mistake." He said the criminal charges should be upgraded. The Bronx D.A.’s office said the case is in its initial stages and hasn’t been presented to a grand jury. Allen’s next court date is in June. In the meantime, Thomas is scheduled for surgery in the next week to repair her fractured orbital bone.